Polyphony and Stephen Layton present their celebrated performance of Bachs most dramatic masterpiece. Accompanied by the Orchestra of the Age of Enlightenment and a starry team of soloists, Layton directs a vivid account, the excitement of the narrative drama contrasting with heartbreaking moments of reflection. In Ian Bostridge, we have the most iconic Evangelist of the last twenty years; an artist who is an incomparable communicator, a singer of technical brilliance, and an impassioned, experienced interpreter of Bachs music. 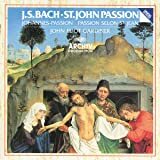 Superb recording of Bach's "other" Passion setting. The Evangelist was marvelous, as were all the other soloists, the tempi generally to my liking (a bit too fast on the opening "Herr, unser Herrscher" for my taste), and the authentic period performance by the Orchestra of the Age of Enlightenment was almost perfect. 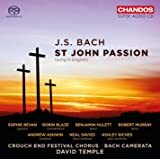 The drama and conflict in the choruses really came out, which is what distinguishes this Passion setting for me from the St. Matthew, as there are relatively few arias. The sonics were excellent. Kudos to Stephen Layton for putting together such a compelling performance. My old vinyl standby is the Richter, on DG Archiv, which was already a significant step in the direction of historical authenticity, and this holds up favorably in every way (even despite the less brilliant Baroque pitch, which makes some of the choruses less forceful), as well as offering some contrast with the older recording, by being more spare and "period"-sounding. 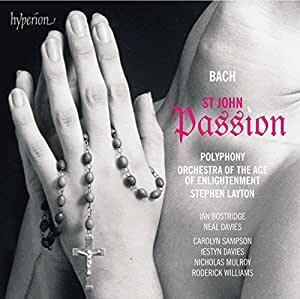 Having listened to this after the St Matthew Passion, I can understand why the latter is considered divine whereas St.John's not. 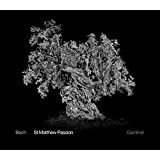 Certainly, the St.Matthew Passion is one of the glories of human creation. If you listen to a good performance you'll end up in tears, which is NOT usual with baroque music! The St.John is as dramatic as the other is reflective. There is emphasis on the narrative, thus the Evangelist's role is crucial. It seems Bach struggled with it until the end, as there are at least three versions. But the "why" would require more reading and study from my side. This performance from 2012 is fine, but there are some things that I don't find very convincing (of course, this is my take and based on comparisons with other versions I have heard or have). The greatest flaw (and I cannot believe I am writing this) is Ian Bostridge (Evangelist) voice status. After having a beautiful tenor instrument that would caress the soul in anything he sang, here he is strained on top, which happens a lot in very dramatic instances. 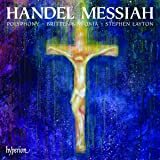 It's not BAD (his articulation is sublime) but there are quite a few better Evangelists in other recordings. Well, nothing lasts forever, Bostridge has been recording for a while and every singer has to experience an inevitable voice decay, no exceptions. 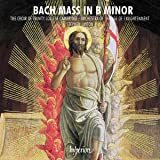 On the other hand, the solo and choral singing is among the best you can find in Bach interpretation nowadays. I am not sure about the conducting; I find it too driven for my taste. 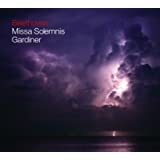 the great voices,the full sound of the instuments make this cd one of my favorites I would recommend to all.